Are you getting the most out of your BOLA Bowling Machine? Many BOLA users are telling us that they would welcome some input from a professional coach on how to best utilise their most valuable coaching aid. 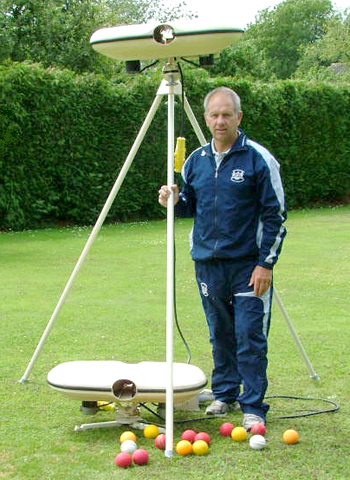 In response to their request BOLA, in partnership with ex-Gloucestershire opening bat and Director of Cricket Development Andy Stovold, will be organising Bowling Machine seminars open to all club and school coaches. The seminars will provide comprehensive advice on all issues that relate to the Bowling Machine including: health and safety; game situation cricket; spin bowling and fitness drills. The BOLA seminars will supplement the current bowling machine content of ECB coaching awards. “Our aim is to promote purposeful cricket coaching with the Bowling Machine,” explained Andy. “There are obviously many excellent coaches working with the BOLA Machine but I estimate that about 50% of our customers could improve the benefits they can achieve with the Machine. The seminars will be arranged throughout the UK for groups of between five and twenty coaches, depending on the facilities available and the chosen centre. They could all be coaches from one club or several local clubs and schools could organise a visit between them. Andy Stovold will also include advice and coaching ideas applicable to the BOLA Fielding Rig where appropriate. 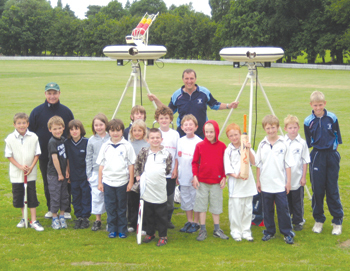 Ian Morgan the Youth Coordinator at Lisvane Cricket Club in Cardiff purchased their first BOLA Machine in 2005. He had created the clubs youth section a couple of years earlier with about twenty boys and girls. This year Ian’s training sessions are attended by about 150 boys and 20 girls each week and they needed a second machine to help them cope. Lisvane have ten ECB qualified coaches who cater for their eleven agegroup teams and this season Glamorgan Cricket Development Officer Peter Edwards will also be running an Academy side. The club took over the old YMCA cricket ground six years ago and are currently hard at work tuning it into a vibrant centre for cricket in north Cardiff with the help of an ECB facilities grant. Felsted School in Essex have an association with BOLA Bowling Machines dating back to 1985 when they bought the fourth machine to be manufactured at the Bristol factory. Master in Charge of Cricket, Charles Knightly, has recently replaced that original machine with two new BOLA Professionals with Stands and Automatic Feeders. Charles, whose career includes captaining Gloucestershire C.C.C. under 19s and County Second team cricket, is a long-term machine user himself having first encountered them at Dean Close School, Cheltenham also in the eighties. Felsted have five indoor nets in their Sports Hall and use matting to create differing speeds of surface. The school has produced several England cricketers including Nick Knight (who would have developed his basic shots in front of machine No.4), Derek Pringle and John Stevenson. They also supply Essex CCC with a steady flow of young players and currently have ten pupils representing the county in agegroup teams.